I will be making the body template about 1/4″ wider all around, but the 5 string neck template is made as well as the headstock template. 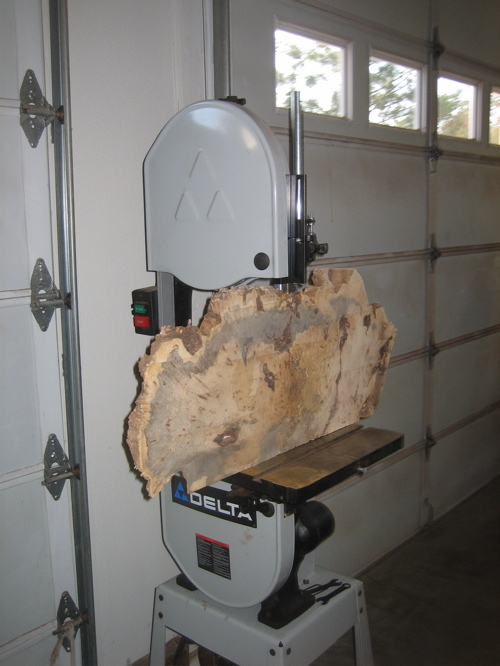 I started cutting the birdseye maple down to final thickness on the bandsaw. I made a really nice cut and I think I should be able to get at least 5 fretboards out of this board. I also cut the rough taper of the maple neck. I got the riser block for my band saw so that now I can cut a board that is 12″ thick! 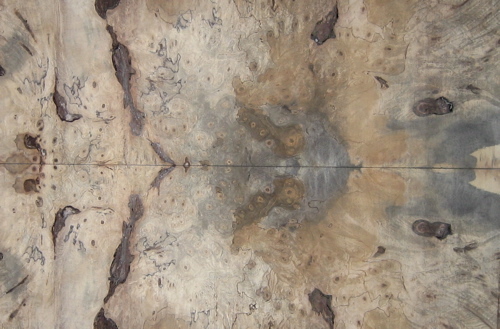 I was able to cut the Buckeye Burl into two bookmatched pieces that are about 1/2″ thick. I will not run them through the planer for fear of them falling apart. So they will need to be sanded to about 1/4″ thick. 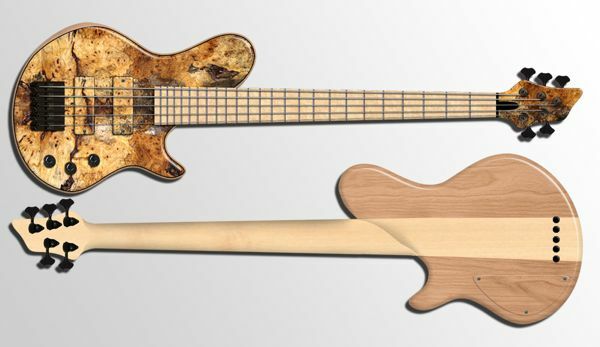 Sorry for the long break on this bass, I was building a neck for the same customer. Pictures can be seen in the news section. Today I started work on it again though. Got the neck cut out to final size and the body rough cut. Truss rod channel was also made. 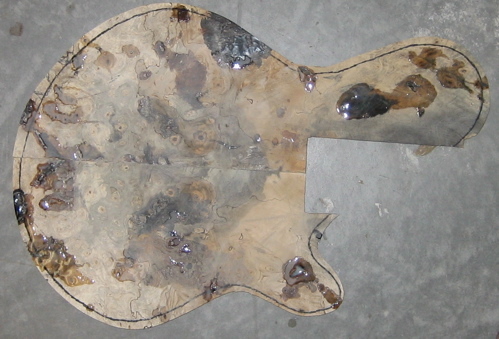 I cut out the rough shape of the Buckeye Burl body and headstock. The back of the neck has also been shaped a little bit as well as a Alder veneer to the back of the headstock. The Buckeye Burl bookmatched pair has been glued together. I don’t know if you can tell from this picture, but I added a strip of Alder to the body where it connects to the neck. 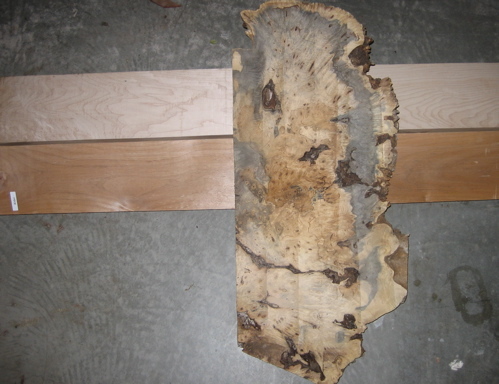 On either side of that Alder, there is a thin black veneer. The small details that make it look good. I cut out the slots for the fretboard as well as the fretboard itself. This will probably be the most noticeable blog post. 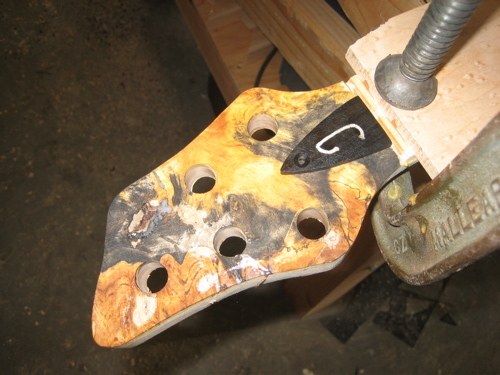 I got the Buckeye Burl top sanded down flat and glued it to the body/neck along with a black veneer. Then I rounded over the edges. This is officially my favorite bass I’ve built! I also put the black side dot markers on the fretboard. I routed the holes for both pickups and drilled the tuner holes. The neck/body transition is being worked on as well. I am putting some hardener into the Buckeye Burl so it won’t fall apart so easily. It looks similar to the finish it will have when it is done. I started the electronics cavity and glued the fretboard on. Everything seems to fit correctly. I am just now to the final shaping of a few parts. Then I’ll make the control cavity cover and recess it. After that it is pretty much down to just sanding, frets, finish and electronics. I put the frets in and have started to file them. The control cover has one coat of finish on. Still need to do some shaping and sanding. I drilled the holes for the output jack and 3 knobs. Those are the best placement for them so the electronics fit in the cavity. After many hours of sanding I was able to put one coat of finish on this bass. There are still a few spots that I need to sand a little more though. 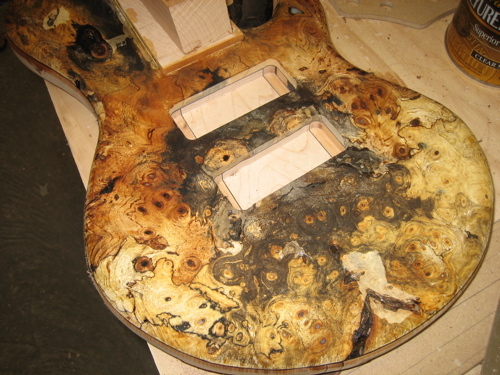 So in about 30 coats (because the Buckeye Burl soaks up the finish so much) it will be done. There isn’t much to update you on the past few weeks sadly. The finish is still soaking into the Buckeye Burl so it is taking time to harden and build up. Once I feel it is hard enough I will route the control cavity deeper, give everything a nice final sand and then apply the finish that will not soak in so much. After that it should be a matter of just putting it together and doing the electronics and final setup. The only problem is I live an hour away from my shop now and I am getting really busy. So it might take awhile longer than expected even though it looks so close. I just thought I’d put this picture up of the finish so far. I sanded off the old finish because I didn’t like how it was turning out. The new one is really nice. It is building up faster too now. It is a lot more clear, the other one was kind of cloudy. The finish is done and I am just now test fitting all the parts again. Still need to drill the holes for everything, do the electronics and final adjustments. The bass is done and is being shipped out tomorrow. The customer will be taking final pictures and hopefully making some nice sound clips as well.